Do you like to try new things in the garden? If so, then 'Tatume', (also often called 'Calabacita') squash could be a worthy candidate for your next garden experiment. This hardy, open pollinated native of Mexico grows well in our hot climate and it produces pound after pound of flavorful firm fleshed squash. 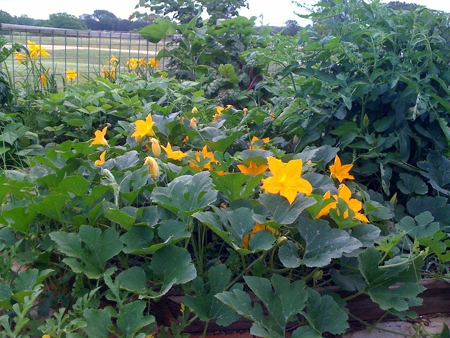 The long vines are prolific bloomers and they produce a large amount of flowers that are beautiful to look at and almost as good to eat as the squash itself. 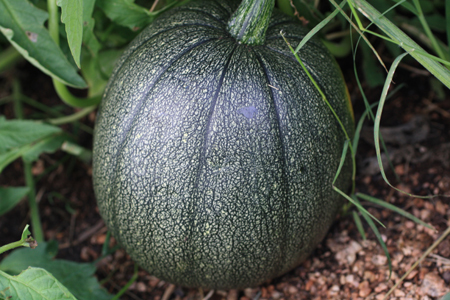 Most of the squash that we are familiar with come from the species Cucurbita pepo. 'Tatume' is a variety of this species. C. pepo is a native of Meso-America and archeological evidence shows that gardeners there have been growing varieties of C. pepo for the past 8,000 to 10,000 years. In America, squash is generally divided into two categories based on when they are harvested. Summer squashes such as yellow crookneck, zucchini, and pattypan are harvested in their immature state. Immature squash have a soft skin, flesh and seeds. Winter squash like butternut, spaghetti, and acorn are simply squash that are allowed to ripen on the vine before they are harvested. Winter squash have a thick hard skin and their flesh is generally firmer and sweeter than summer squash. 'Tatume' is one the rare varieties of squash that can be harvested as either a summer or winter type. 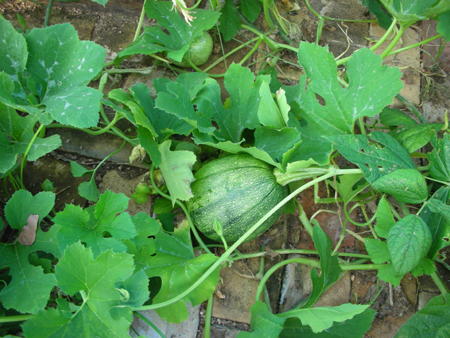 The fruits of the 'Tatume' squash are round or oblate in shape. Their skins is striped green and they resemble a small watermelon or pumpkin in their immature form. It is best to harvest 'Tatume' when it is about the size of baseball. If left to mature, the skin will become a mottled, deep green and they can grow to almost the size of a soccer ball. As far as I can tell, there are only two drawbacks to this amazing squash; finding it and containing it. Since 'Tatume' is an heirloom, or open pollinated variety, it is not carried by all of the major seed companies. It also appears to be the squash of many names. Many seed catalogs list it as 'Tatume'or 'Tatuma' but I have also seen it listed as round zucchini and Mexican zucchini. In the markets of Mexico, it is most often called calabacita (little pumpkin, or calabash). Whatever you call it, it is a very versatile and flavorful squash. 'Tatume' does have an aggressive vining habit. It is not uncommon for this squash to send out vines 10' to 12' in length. Each node on a vine can root and send out other vines. So, if you are going to plant it make sure you have plenty of room to let it run. 'Tatume' is a staple in Mexican cooking. This year, my wife and I have used it in lieu of yellow squash in all of our squash recipes. We have fried it, baked it, boiled it with onions and made it into a casserole. We even harvested and sauteed the blossoms. However, our favorite thing about 'Tatume' is the way that it cooks on the grill. 'Tatume' is more flavorful than yellow squash and its flesh is much firmer. Its round shape and firm texture allows it to be cut into thick round patties that are perfect for the grill. A little EVOO, garlic salt, seasoned salt and fresh ground black pepper make for a simple but delicious summer side dish. 'Tatume' is a squash variety that possesses all of the traits that make squash one of my favorite summer vegetables to grow. It is hardy and productive, and usually almost immune to the squash borer insect (Melitta curcurbitae, a clear-wing moth), which makes it a reliable garden vegetable in infested areas. Its long vines produce a fabulous show of big yellow flowers that draw bees into the garden. It is tasty and versatile in the kitchen. My experiment with 'Tatume' has convinced me to add this to my keeper list. I highly encourage you to try it in your garden as well!